A paper in Bull. B.O.C. 2015 135(2) by Julian P. Hume details overlooked illustrated documentation of large-scale live capture of Passenger Pigeons for sporting purposes. 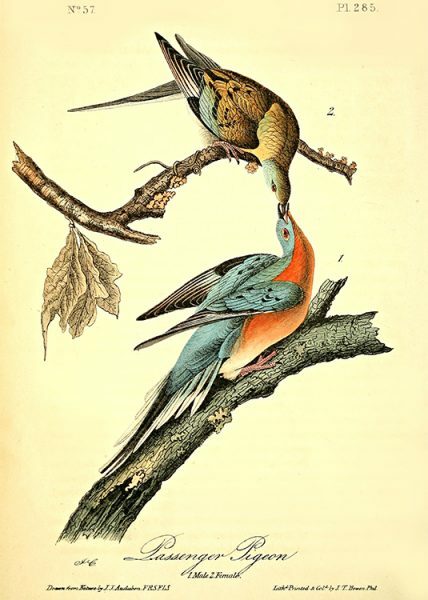 Summary—More has been written concerning the extinction of Passenger Pigeon Ectopistes migratorius than any other extinct bird; the effects of trapping live birds for the shooting industry in the latter half of the 19th century is also seemingly well known. Here I present overlooked accounts and illustrations that appeared in contemporaneous newspapers describing the techniques used to capture live birds based on the experience of a professional pigeon trapper, and the subsequent fate of captured birds in shooting contests. View the full table of contents of Bull. B.O.C. 2015 135.